Every year, the guild makes anywhere between forty and sixty quilts that we give away to – breast cancer survivors, tornado victims, veterans in wheelchairs, homeless shelters…. 1. What led you to the mission of being a quilt maker? After college when I was a compulsive study-er I was living in New York and I was at a loss what to do in the evenings in Manhattan. I was not a bar person and I don’t watch television, and I’m not a big movies fan. You can only read so many books, so I was actively looking for a hobby that would totally engage me. My college roommate lived up in Schenectady, New York, and bless her heart, she would invite me up for weekends. I loved my job, but New York City and I weren’t totally harmonious together, so I needed to get out of the city. Every time I went up, she would teach me something new. I tried to crochet. I tried macramé. I tried needlepoint, bargello, and knitting – the whole nine yards. I would complete a project, but not be inspired to do anything more. After I left New York, I moved to Boston and I heard about a class in the evenings at the Harvard Cooperative Extension. I signed up for a quilting class and I took it. This was back in the 1970’s. The problem was that the fabric selections were very meager, and the course was all about hand quilting. I loved to quilt, but it was like, “I’ll never get anything done!” I had a full time job and hand quilting is very time consuming. So I kept it in the back of my mind and I didn’t pursue it very much. I made pillows, but that was the extent of my quilting. I moved to Rochester, New York and someone said, “I’m thinking of starting up a quilt group because I love quilts. Would you consider joining?” I said, “Absolutely!” So I joined this group in Rochester – The Irondequoit Quilt Group or Quilt Association. Our homework each week was to make one to three block squares in lots of different patterns. She would also guide us in our fabric selection. At that first class she reviewed the fabric we chose and then explained that you have to evenly divide between light, medium, dark, and very dark fabric in whatever color selection you pick. I had never had anyone teach me about value and contrast. Every week the assignment was one to three blocks depending on how big your quilt was going to end up being in the end. I would stay up until one or two in the morning, doing my assignment, and thinking, “Oh my God! I have to get up and go to work in the morning!” I was working full time at Kodak. I knew this was it because I would let my coffee go cold. I would stay up all hours. I would always do as many blocks as I possibly could. At the end of that first class which was seven weeks, I ended up with a finished quilt top. She told us how to quilt it. She was an advocate of hand quilting at the time. My first quilt was hand quilted and we still use that quilt around the house. We use it as a comforter. I had never joined a quilt guild before partly because I had little children and I was working. I just didn’t have time for anything extra. My extra time was spent taking the quilting classes and working on my quilt tops. I was at a class and a couple of women in the class said, “Oh we belong to a guild. We should get you to join. You should be a part of our guild.” Bless this woman’s heart, she called me three times and told me about the next meeting and said, “Are you going to come? Are you going to come? There’s no obligation. You don’t have to join the guild. Just come to the meeting.” And so I did. 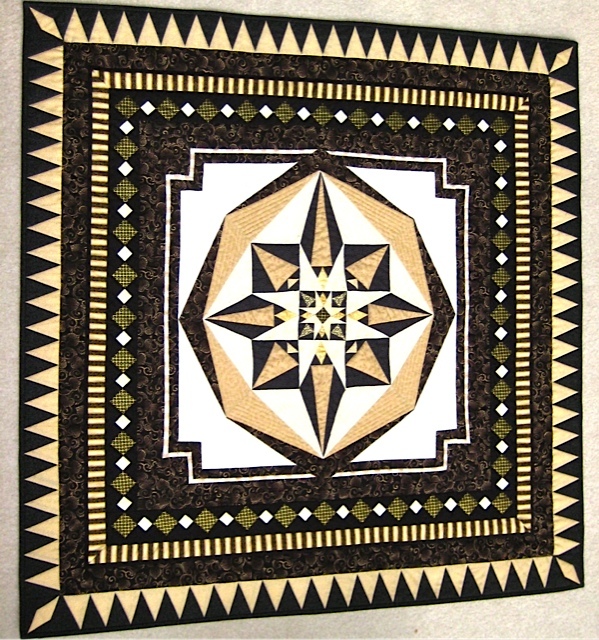 I have since become a member of the guild and I love it because a good part of what we do making quilts for charity. Every year, the guild makes anywhere between forty and sixty quilts that we then choose a charity to give them to. Sometimes it has been homeless shelters. We gave quilts to a hospice for women dealing with breast cancer. One year it was for veterans in wheel chairs so they wanted lap quilts. We tried to make a lot of patriotic quilts that year. We gave them to tornado victims in the tornado that hit Massachusetts last summer. That’s something that we do that is a wonderful thing. It’s a wonderful thing! 2. What does being a quilt maker mean to you? My quilt guild is called Wayside Quilters. I went to a memorial service for a friend’s father who lived to about ninety-five. 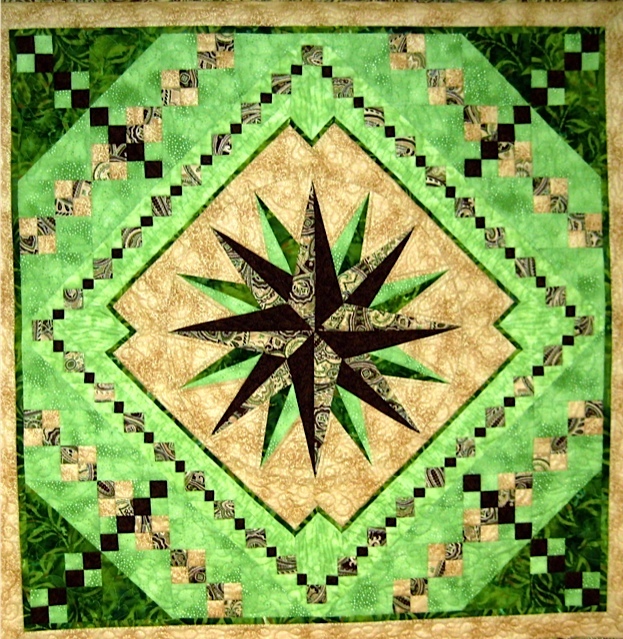 My friend asked me, “So what are you doing now since you are retired?” I said, “I’m quilting!” I said besides mothering, wife-ing, and homemaking, I had joined this guild and she said, “Oh which guild is that?” I said, “Wayside Quilters.” She said, “I have a quilt made by Wayside Quilters.” I looked at her with a look of puzzlement on my face and said, “How?” She said, “I had breast cancer. I went out to the Healing Garden and they had this whole tableful of quilts your guild had donated and they let me pick whatever one I wanted.” She said, “It’s the most beautiful object in my home.” It was like, “Oh my God. I didn’t even know that she had had breast cancer and she was willing to tell me this because of the quilt connection.” She said, “I love that quilt.” It was so wonderful to hear. Lots of time I don’t hear from people who actually get the quilts. We hear from the organization that we give them to, but we don’t hear from the recipients. To spontaneously have this woman say, “It’s the most beautiful thing I own”, gives me great comfort.” She said she sat under it when she got cold and that it was wonderful, absolutely wonderful. The Healing Garden is a wonderful place where women with cancer can go and they offer classes and discussion groups. Quilting means I have an inspiring, joyful activity for my free time that ends up with a product. I spend my time making quilts and at the end of the time I have a quilt that I can give away or do something with. So it’s not like cooking meals that you can spend most of your time on and then they are consumed. 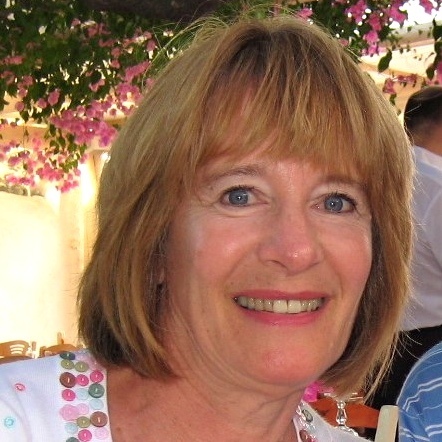 I can have artistic, creative outlet – although I don’t consider myself very artistic! This is so difference from the left-brain activity that I’ve always engaged in because I was always geared to science, physical therapy, and all that stuff. This is a right brain outlet. I love the idea of belonging to this guild because it does so much for charity, plus it’s a great group of women. We only meet about nine times a year and over the course of the several years that I have belonged, I’ve gotten to be good friends with them and they are great, wonderful people. We do have two men in our group now. 3. What was your best day as a quilt maker? My best day is when I’m really engaged in trying to figure out how to do something challenging and I finally get it! Quilting is quite challenging and you have to stick to it. If you do stick to it and keep telling yourself, “I can do this, I can do this – people can do it therefore I can do it”, and you end up accomplishing it, it is a huge accomplishment. It is really cool. And so I do keep taking new classes and trying new things. The one thing I don’t care for is stuff that is highly repetitive – doing the same thing over and over. I have made a couple of those quilts where all the blocks are the same with maybe a slightly different fabric. After a while I think, “OK, this gets to be a little bit tedious.” I finish it and say, “OK. I’m not going to do one of those again.” Then I do something else. There are so many variations on quilts. You can go into really artsy stuff that a little bit I have done, but I don’t spend a lot of time doing that. 4. What was your worst day as a quilt maker? This was just recently. We had an outreach day for our guild, which is a day from nine to four when the whole group of women comes together on a Saturday. We put together the pieced tops that people have made, make a “quilt sandwich”, and quilt them. Usually I bring my sewing machine and quilt one of these sandwiches. However, this time I was distracted because I going to leave on a trip and was not fully ready for the trip. When I got to the guild, I didn’t have all the stuff I needed to put the quilt together correctly. Usually I put the quilt together on the floor; however, there wasn’t enough room for that at the guild. I did it on a table. It really didn’t go together well. There are gloves that have grips to help you pull the fabric through the sewing machine. However, I had forgotten to bring them. I hadn’t brought a certain foot for the machine. All these things conspired to make it not come out the way I wanted it to. The quilt had creases in the back. I said, “OK. This just isn’t working. I’m going to pack up and go home and I’ll fix it and work on it at home.” That’s what I did. I thought, “I know it is because my mind was distracted when I was packing up for this outreach day. I hadn’t adequately prepared. I hadn’t brought all the stuff I normally use. I think mentally I wasn’t totally engaged in what I was doing. Not that I didn’t want to be there because I certainly wanted to do my part. It was just very frustrating that it was not coming out to my expectations. So I said, “OK. Let’s just go home and finish packing for the trip and we’ll deal with this when I get back.” And I did! That was probably my most frustrating day. It was a lack of focus, preparation, and planning. I think it is pride in what I do and wanting to do it to my standards. My standards are not correct for everybody else. They are just the way I want to do it. Even though this quilt was going to go to a homeless person, I wanted it to be something of beauty. Someone had put time into making the top and I wanted to complete it in a way that represented the quality of the work they had already done. I just said, “I would rather rip out the stitching that I’ve done and do it right. It’s not going to take me that much time.” You know it was a real desire to have it completed in a way that I could be pleased with it and feel and know that thought and care and love had put into this quilt. I think it’s the way I way I was raised. My parents taught us to do a good job and not be crazy about it. You should try to do your best work, but not set yourself up to expectations that will cause you to fail all the time. If you do make a boo-boo, usually it’s reversible. My parents were always incredibly loving. There was never a swear word in my house. Occasionally my dad would want to get moving and would say, “Come on let’s get this car packed up!” if we were heading up to our cottage for a weekend. He would ask me, “Are you really going to work on all those textbooks this weekend?” I’d say, “Yes dad”, and I’d make sure I did. But, it was always with a lot of love. That has been one of my guiding principles in life that every day you can spread some sunshine somehow. If spreading sunshine is teasing clerk at the grocery store, complimenting someone on their tie, or hair ribbons, their earrings – whatever – I try to make a point of doing that on a regular basis. I think the world needs a lot more love in it. There is so much trouble going on in the world that if I can in my own little world create some more good feelings and warmth and relationship with people, then I try to do it. 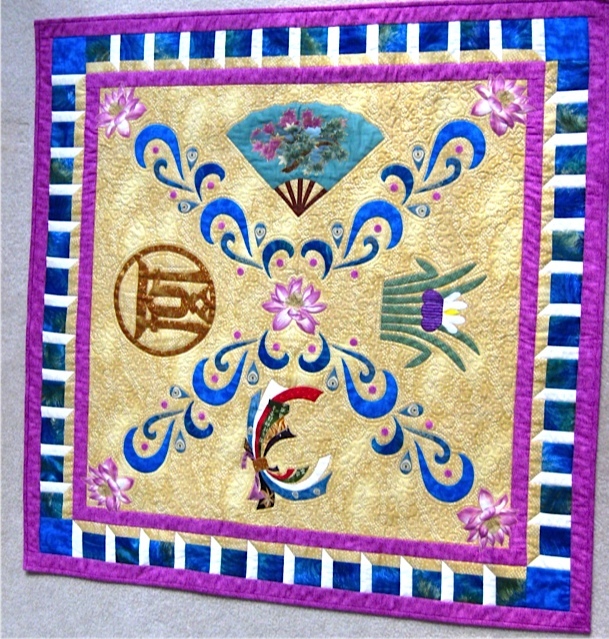 The quilting guild outreach was a gift from my heart and my sewing machine. I wanted to spread cheer, happiness, and goodness in their lives. I think it is important that people find something that they can feel passionate about. It may be passion about cooking, passion about their dog, or passion about their job. But something that they love to do that they don’t feel is a chore, duty, or obligation. It’s something they feel so passionate about that they just want to do it to the best of their ability. They have fun with it and create good feelings. With quilting, it’s important to remember that it is OK to have a little mistake or boo-boo because it will still be appreciated and loved. Not that it’s a license not to do your best work; just that it’s OK if it’s not perfect all the time.